Electrodermal Activity (EDA) is typically viewed in microsiemens (μS). Depending on how the EDA was collected, the method of converting it from volts to μS will be different. This article details the various ways to scale data from volts to microsiemens in BioLab and the EDA Analysis application. If you are acquiring data with a MindWare Mobile, this data is scaled to the appropriate units automatically. However if you are using different hardware such as a BioNex Impedance Cardiograph & GSC module or a 3rd party system, you have to scale this data manually. EDA data is scaled from volts to microsiemens by multiplying it by the chosen gain. On the Impedance Cardiograph & GSC and 3 Channel Bio & GSC modules, this gain is programmable and typically set to the values listed here. If you are using the Impedance Cardiograph & GSC 2 module, the gain is fixed at 10, so you will always multiply the signal by 10. 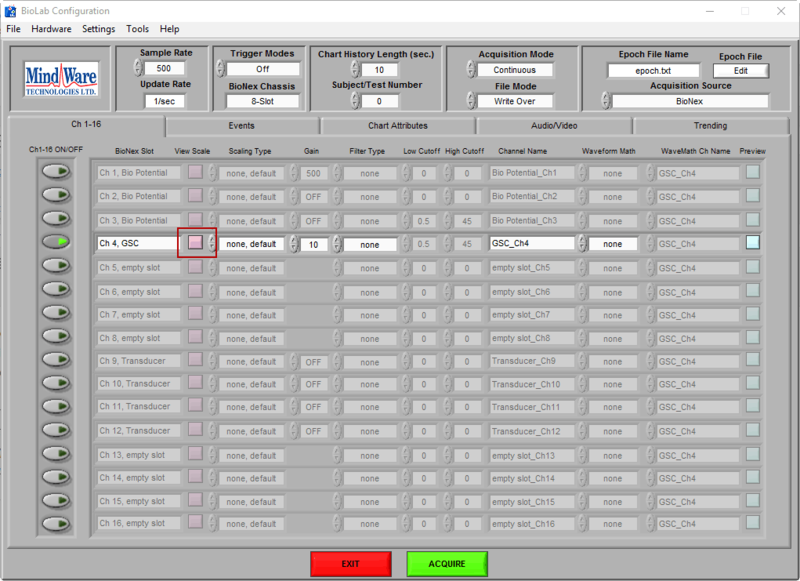 Scaling cardiac impedance data in BioLab allows you to view the data in actual units during acquisition, which can be useful in determining data quality. On the BioLab Configuration screen, press the Preview Scaling button next to the GSC channel to open the scaling window. If you are using a MW Mobile, you will see that the channel is already in the proper units even though there is no scaling applied. 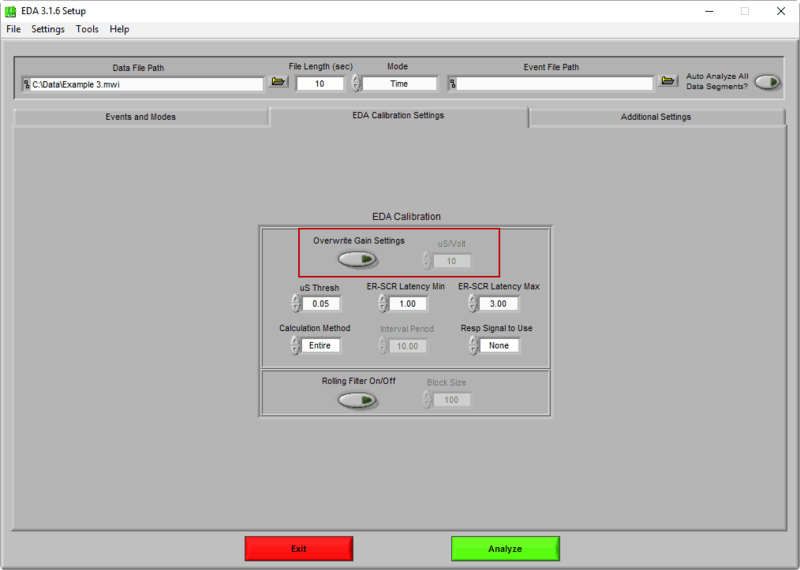 Scaling data to microsiemens in the EDA analysis application is crucial to calculating statistics based on the average skin conductance level. The field used to scale the data is found on the EDA Calibration Settings tab, labeled μS/Volt. In the event that the detected gain setting is incorrect, you can overwrite this value using the Overwrite Gain Settings button. If you are analyzing data from a MW Mobile, these fields will be disabled as the scaling is automatically applied for you. If you used 3rd party hardware to collect your skin conductance data, use whatever values are appropriate in this field to scale it.